At least he did on Saturday. I was riding downtown with Chuck Hatch and stopped at a light on Woodward Avenue in Highland Park. Two fast-moving guys on mountain bikes blew past us. I turned to Chuck and noted that one of them looked like Chelios. So to find out for sure, I sprinted after them. Fortunately I was on my road bike and closed the gap, making sure I slowed a little bit before catching them so that I’d have some breath left in me. Yes, it was Chris Chelios. He said he rides down Woodward to get downtown presumably to work. I introduced myself and my job of building trails in Detroit. I’d asked him if he’d heard about the recent Dequindre Cut opening. That’s not suprising. There were some other big events that Thursday as well. Why all the wigs on the road? 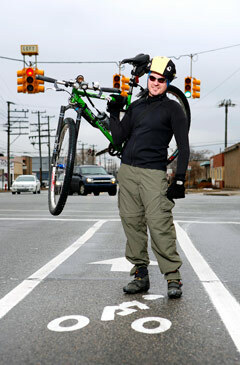 Thanks to metromode for writing about cycling in Metro Detroit. As I told my friends, I don’t normally ride in baggy hiking pants, but it had rained the night before and my cycling tights were still damp. I was wearing my Patagonia Windshield top, which was a great choice for the balmy Michigan winter weather.